Say good-bye to real estate VPs, SVPs and EVPs? The New York Department of State says in a stunning opinion letter distributed Monday by the Real Estate Board of New York (REBNY) that many of us real estate salespersons and associate real estate brokers, including me, are violating the law. Associate Attorney Whitney A. Clark states in the letter that those of us who adopt or receive corporate titles such as vice president on upward are in violation of the real property law if we are not actually officers of the corporation — for example, any incorporated brokerage. Out and About: Desperate measures warranted? Truncated living room in an Upper West Side studio apartment. Given the cost of residential real estate in Manhattan, nothing could be more understandable than buyers’ willingness to match the imperfect co-op or condo that they decide to purchase with the amount of money they can afford. Consequently, many folks in search of a new home readily accept the necessity of turning a two-bedroom apartment into a three-bedroom unit, an alcove studio into a one-bedroom home. But they invariably pay a price both in aesthetics and, paradoxically, flexibility. Gone the dining area, the well-placed window in the living room, the airy ambiance. If love is blind, trust should not be too. It was time for my buyers to consider how much the essential renovations would run them in the event they wanted to make an offer for a two-bedroom apartment on the Upper West Side. 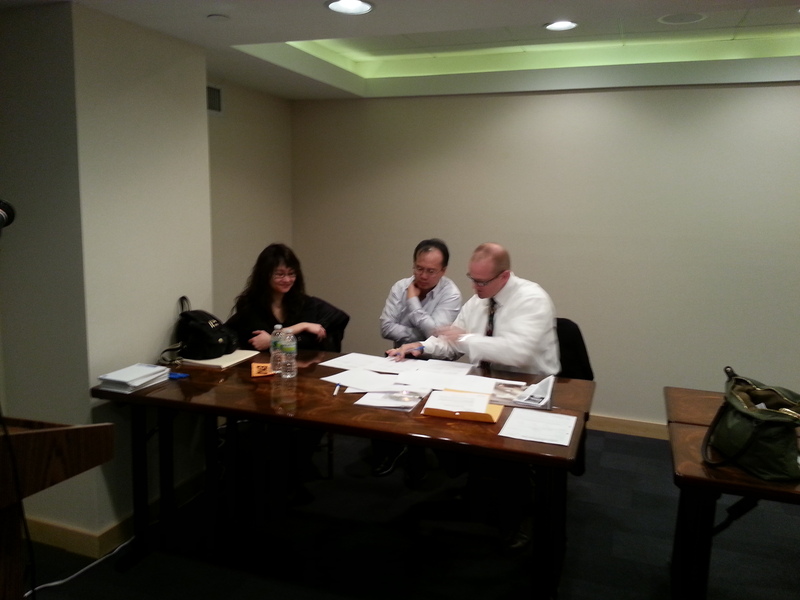 Stella Tsang (left), her husband center and auctioneer Mike Lewis going over contract. A Long Island woman who gave her name as Stella Tsang was the winning bidder at today’s auction of a Chelsea condo that the U.S. Treasury Department seized after a former president of Taiwan pleaded guilty to money laundering. Agents don’t sell homes. Buyers do it themselves. Out and About: What is the color of money? View through kitchen into living room of Upper West Side condo. Conventional wisdom has it that vivid colors can be an overwhelming obstacle to the sale of a residential property that is on the market. Mostly the notion seems to hold true. It is difficult, the argument goes, for prospective buyers to imagine themselves in a home that speaks too loudly of its sellers. In fact, I recall one client of mine who rejected a house in suburban Washington, D.C. — solely, she said — because she hated the wall covering in the living room. That sort of reaction happens more often than you might imagine. But the well renovated apartment pictured here may defy the advice to tone down an apartment’s personality as expressed by bright colors.